John Tsang Chun-wah, former financial secretary, declares his bid for the post of chief executive with an appeal for trust, unity and hope. It was during a time of great uncertainty some thirty four years ago, when China and Britain started negotiations on Hong Kong’s future, that I returned with my young family to Hong Kong from the United States, and joined the civil service in this great city of ours. I have been fortunate to have held in my 34 years of public service a good number of positions in a wide range of policy areas that impact on the people of Hong Kong. So much so that I dare to say: I know Hong Kong. I have big dreams for this city of ours, and together, I know we can overcome the many challenges that stand in our way. Hong Kong is a great city operating under the concept of “One Country Two Systems”. This is a unique framework that best suits our development. I have witnessed the tremendous clout that our nation now wields on the world stage, and I have no doubt that Hong Kong will become the leading international financial centre on the back of the economic strength of China, and visionary initiatives, such as ‘One Belt One Road’ and FTAAP, that are at the beginning stages of implementation. But we do need to check the disruptive elements that are threatening to curb our growth – the anger, the polarization, the occasional irrational talks of independence and the confrontation that has torn our society apart. Hong Kong never speaks with only one tongue, and has not followed only one dictum; Hong Kong does not just serve the business sector or the labour sector; Hong Kong does not just serve those born in the 50’s or those in the 80’s. Hong Kong is all of that. The situation in Hong Kong today cannot be resolved by mere force and aggression; it requires restraint and moderation, on the part of everyone. We must pay tribute to diversity, inclusiveness and rationality in our society, the core values that provide a common ground for all the people of Hong Kong, and which the Government is duty-bound to preserve. We became a great city because of our core values which include the rule of law, fairness, integrity, freedom, democracy, diversity, inclusiveness and caring for others. As the custodian of these values and strengths, the Government must refrain from undue interference, and provide at the appropriate juncture the necessary conditions for our economy to become even more balanced and more diverse. We became a great city because we have the flexibility to adjust. We believe that market economy is an effective tool to create wealth and allocate resources, but markets can fail. Speaking from experience, we can make good use of the market to serve society. We cannot be blinded to the economic problems and wealth disparity that we face today. Instead of acting against market forces, our mission is to remedy its pitfalls and improve its implementation, helping those who have fallen through the safety net, and ensuring a decent livelihood for those who are willing to contribute to the success of Hong Kong. A great Hong Kong also means that its people lead a healthy and respectable life. The present government’s diagnosis of the housing problem is largely correct, and I wish to state clearly my intention to keep producing more land and more housing to tackle the problems of housing shortage, ageing buildings and high property prices. These issues place a huge burden on our people. They are also stunting the growth of business in Hong Kong. As we develop, we need also to keep in mind the necessity to preserve the priceless natural environment of Hong Kong, and the heritage buildings that embody our collective memories. I shall consider all possible means, including large scale reclamation and urban renewal, to produce more land and to enable Hong Kong citizens to enjoy better living conditions. A great Hong Kong also means that the people here should be able to lead happy lives, and see Hong Kong as their home for generations to come. We are one of the longest living people in the world, but mere longevity is not good enough. We are told by various surveys that the people of Hong Kong are not happy, and that may explain some people’s wish to emigrate. It is my sincere wish to change these attitudes, and ensure that all the people of Hong Kong can lead fulfilled and happy lives. A great Hong Kong would be a place brimming with vigour and vibrancy. It would be a place where young people are able to see a future for themselves, a place where they wish to raise a family and a place where their hard work would be duly rewarded. I look forward to hearing their ambitions, whatever they are – starting a world-class business; pursuing further studies; or even dabbling in farming. And I wish to help them map out a blueprint for their future. I may not live long enough to see it all, but I can help lay the foundation for it. I am not an eloquent speaker like many of you out there. But I do have a gift of listening and pondering deeply what other people say to me. People who have known me all these years find me easy to work with, and I find myself always surrounded by people with diverse talents and experiences. Today I am standing before you, the 7.35 million people of Hong Kong, not as a single person , but as a team of committed Hong Kong citizens with a common vision: to work together to make our city an even greater place to live. Looking back on my life, my greatest realization is that confrontation, pessimism and prejudice are not inevitable. What we need is to rebuild trust, reestablish unity and rekindle hope. These are the three keys which are set out on the backdrop behind me. With the right measure of good will, faith and hard work, we can find the solutions, and we can write the history that we want to see. What I fear most is that the confrontation and conflicts that we have seen in our society recently have eroded permanently our courage and confidence to seek solutions. But, looking back on history, darkness always gives way to light – if only we could hold on to good will and hope. Is it a difficult target to aim for? Of course it is. You may choose not to trust me to do it alone, but you must trust the collective faith and good will of all of us. Where others see a depressing situation, I see courage in changing the course of history; where others see a society torn apart, I see dawn at the end of a long dark night. If I can see a future for Hong Kong, so can we all. I have done a great deal of soul-searching of late, and I can genuinely tell you that I am more determined now than ever to serve this city of ours. In fact more determined than what had urged me to return to Hong Kong in 1982. I declare I am running for Chief Executive of Hong Kong. 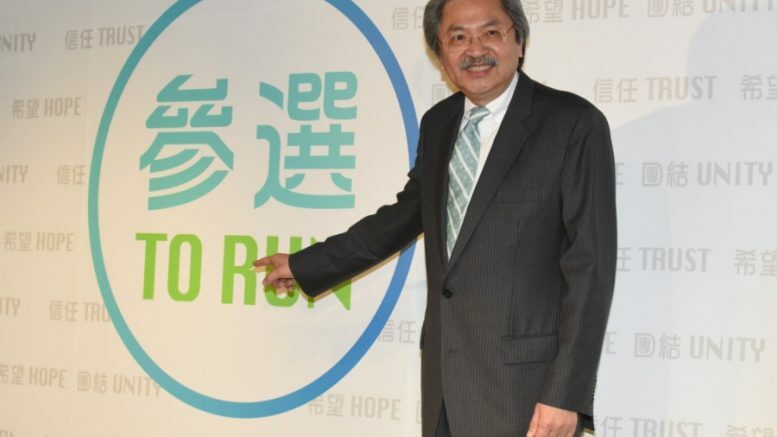 John Tsang Chun-wah is former financial secretary. This is his declaration speech for the bid for the post of chief executive delivered at a press conference on January 19. Be the first to comment on "Trust, unity, hope"